Yesterday, we returned from the office on a high – it had been a good day and on the way back, we’d popped into the vets to get a reference for something very exciting set to happen this weekend. It was to be a happy pet week. Carla & Boron greeted us at the door as usual and we pottered around with them for a couple of minutes before I went to find Carbon – see where that lazy bones was. He was on the bed. When I stepped into the bedroom doorway he meowed at me – like he often does to say hello when he can’t be bothered moving, and I called him lazy. His second meow told me something was wrong. He tried to get up to walk across the bed but his back legs weren’t working. I screamed for John and we both watched as Carbon tried but failed to walk again. We rushed him to the vets and were seen straight away. With no pulse in his legs or feeling in his toes, and a new heart murmur, the vet diagnosed a thrombosis. Her colleague agreed. The heart problem would probably have been developing for a while but the onset of the last clot would have been sudden. Treatment options are incredibly limited and will most likely fail, just prolonging his pain so instead, we had to say goodbye. Carbon was an awesome cat. Truly great. We – him, Carla & me – had our ten year anniversary together last June and while he was nervous with strangers, he’s always been happy and loving with me, and later with John. 1. 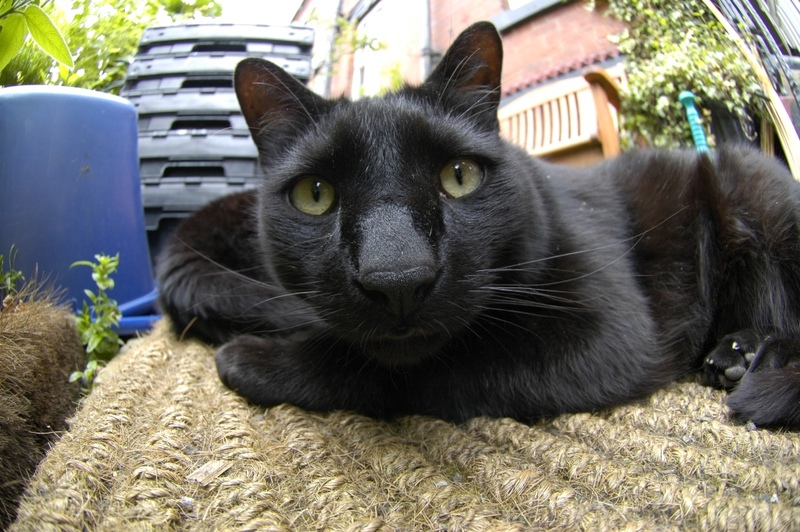 He had the longest nose of any cat I’d ever met. We used to joke he took after his prominently proboscised dad. We used to call him Mr Long Nose. We used to call him a lot of things: Carbs, Carbon-cat, Carby, Carby-Carb-Carb, Carbo’, Carbonara, C, Crabon, Crabs, Scabbles, Chief, Mr Fang, Mr Whiny, Senor Whinestein, Obi-Whine Kenobi, Whine-akin Skypurrer, the Moose, Giant-o, Cougar… He also had the palest lemon eyes and the silkiest tail of any cat ever. His ears were slightly rounded at the top too – I could recognise him just from the tips. 2. When I first met him, he was asleep on top of his sister in their RSPCA cage. We thought they were just one giant cat until a second nose and pair of ears appeared. I remember that first meeting very clearly and how, just a few hours later, we took them home. 3. He wasn’t a great hunter – he once caught a misc brown bird in Liverpool (I told him he couldn’t bring it inside because it wouldn’t match the colour scheme) and he also “caught” a magpie in Leeds – “caught” because the magpie was surprisingly well intact for an angry bird and an inept hunter — we think it probably froze to death and he found it. He was so proud that he’d found it. 4. He was a greedy little guy and his most favourite thing was cooked ox heart. He had it regularly in Liverpool but it wasn’t as easy to find over here so it was a rare treat. We got them some at Morrisons the other day though – they had some raw then I slow roasted the rest and they all LOVED it. 5. Alongside eating, his other trademark was his whine (hence the whine-themed nicknames). He worked out the acoustically optimum place for his whining in the house – usually the bottom of the stairs – and whiiiiiiiiiiined. It was usually a locating device (to hear where we responded from) but in the morning, it was also a “get up and feeeeeeeed meeeee” whine. 6. Carbon was my best friend in the morning because I always gave him the dregs of my cereal milk. 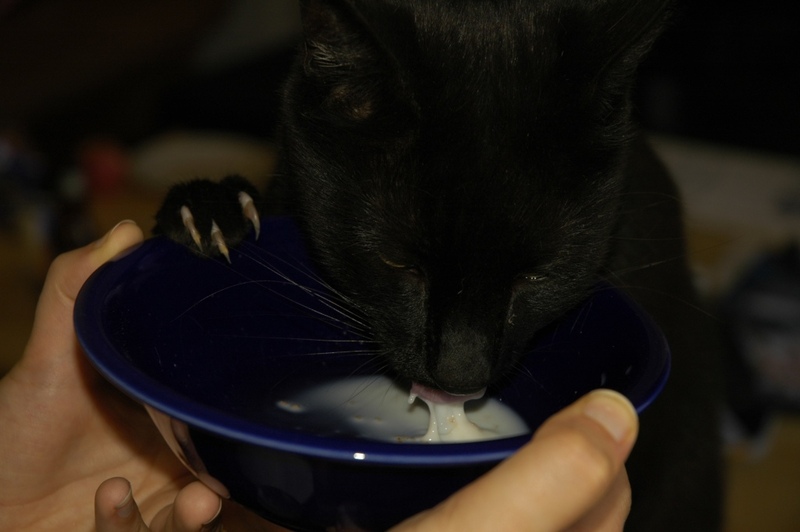 It was our little ritual and whenever I ate cereal out of the house (such as in the car on the way to the office), I always left the dregs before remembering he wasn’t there to drink them. 7. While waiting for the milk and at other times when he wanted a hug, he was the cat most likely to stomp all over my keyboard. Just the other day, he managed to do some unknown key combination to transfer all my email from one account into the inbox of another account but he usually just tried to turn on Caret Browsing (F7), loaded Mozilla Help (F1) or tried to prnt scrn. 8. When he ran across the tarmac in Armley, he used to run like he was from under the red sun, as exemplified by Florp the stand-up comedian in the Futurama episode, My Three Suns. He had a lovely gait and I never tired of watching him quick-walk around. The white spot on his chest would jiggle as he moved. 9. With Sili, our beloved little girl who died of stomach cancer last July, he’s on Google Maps Street View. The road was quiet enough that they could sit out there all day without being disturbed too much. 10. His fangs stuck out of his mouth a little way, little white tips on his black lips. Sometimes I’d stroke them while he slept. 11. Like his sister, his belly sometimes smelled like popcorn. He’d let me bury my face in it and tickle it – but if the tickling got too much for him, he’d gnaw at my knuckles – not biting, more like how a baby gums a toy. His most memorable smell though was after he’d been running and he was sweaty. Sweaty cat is my favourite smell. I’d inhale that deeply. 12. When I entered a room and caught his eye, he’d puff out his chest and move his head around, proud and happy, waiting for a tickle. 13. He had a loud rumble of a purr but sometimes environmental noise would drown it out and you could just feel him vibrating. 14. Curled up on our knees, he’d often stretch out his long front legs so they’d dangle in the air in front of him. We called this SuperChiefing. 15. At night, after his dinner, he’d like a drink of water. Specifically the water in the beaker on my nightstand. I’d shoo him away but when I wasn’t looking, he’d stick his nose in. I’d frequently wake up during the night to the sound of lapping. 16. In Liverpool, when he had to stay in at night, he used to join me as soon as I went to bed and cuddle up next to my belly while I read. Then later, when Carla came into the bedroom too, he’d relinquish the prime spot to his sister and he’d curl up next to my legs instead. In Leeds, when he could come and go as he pleased through the cat flap, he was out most nights for at least part of the night but during our last few weeks, after a couple of fights with a new cat on the block, he started sleeping with us. That continued here and he slept with us nearly every night, including his last. His last day was a good one: he started it asleep in bed with us, relocated to a sunny window sill, came back to bed for a big cuddle, had a nice breakfast, sat outside in the sun & got to see a squirrel. We were out – a rare day at the office – but as far as we can tell, he was on his cushion (he loved cushions) in the sunny bay window when he got sick then moved upstairs to bed before his legs gave way. I wish we’d been here but there would still have been nothing we could do. We buried him this morning. He hadn’t been in this house long enough to acquire a favourite spot but we buried him near the beck. It was the heaviest 5 kilograms I’ve ever lifted. We’re going to miss that little boy a lot. We’re so sorry to hear about Carbon, I remember him well from when I used to visit, and of course from your website and tweets. 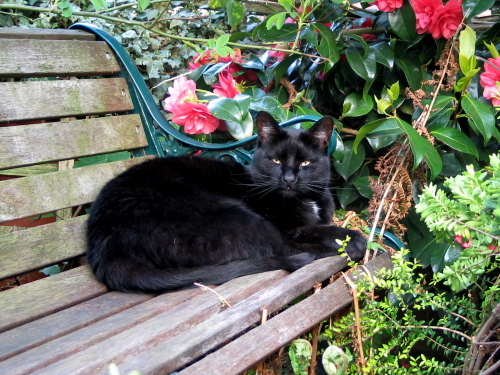 He was obviously a well loved cat, may he rest peacefully on the big furry cushion in the sky. This is such a lovely post – it’s so funny that they’re on Google Streetview, looking at the camera as though they’re posing deliberately! Didn’t realise you were in Leeds, have we met?